There were no clear signs anywhere. No signs for toilets at the train station; no signs for the bus stop. There was no signpost from the train station to tell us where we could take the bus to the Doctor Who Experience. It really was strange walking about Central Cardiff with no idea where to go. I saw the place where the Tardis landed in the episodes Boom Town and Utopia. It was awesome! There were a lot of Welsh flags everywhere. There were many flying in the street. It seems strange seeing how there are barely any Union Flags here in England. There are lots of Wales flags in Cardiff. So now onto the Doctor Who Experience. There is the Adventure and then there’s the Exhibition. I won’t say much about the Adventure because it is better to experience it yourself, but I will mention a few moments which made my Whovian heart tingle. First of all, Romana’s involvement in the Adventure, the use of Classic Series clips and voice-overs as well as many kinds of Daleks, all showing that this isn’t just focused on New Who, but the whole show, which is appreciated. I like Special Weapons Dalek. The Exhibition is the main meat of the Experience. There are three Tardis consoles in the first half, and upstairs there are many costumes of monsters from both Classic and New Who. There is a whole section on Cybermen (exxxxxxcelllllent) and the Daleks (including the awesome Special Weapons Dalek). The costumes include Yetis, Ice Warriors, Melkur (nice obscure monster there), Sycorax, the Face of Boe and Weeping Angels. Costumes worn by different Doctors. The costumes worn by the first to the sixth Doctor. Lots of Daleks at Doctor Who Experience. 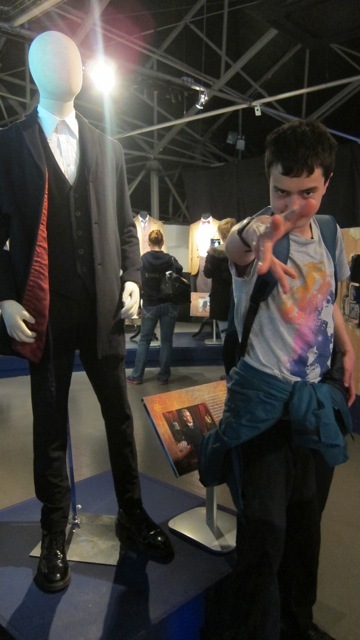 Standing in front of the costume of the current (12th) Doctor. Sorry, forgot what I was saying. The costumes are mostly original or modified versions. There are also costumes from the companions including Jack’s trenchcoat and many of Clara’s costumes (my mum’s favourite section). The Series 8 segment was also great, with the Mummy, Spiders and Robot Knights all there and every episode being covered (though the Teller was absent). 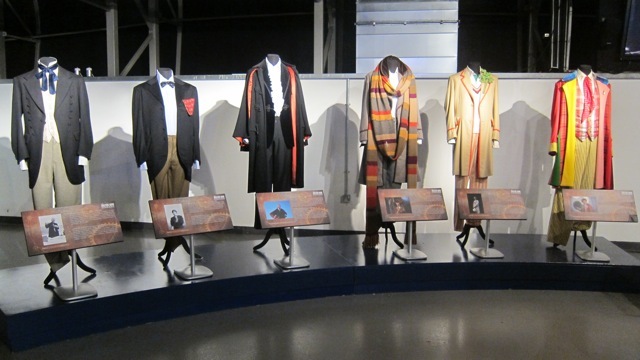 My favourite section (other than the Cybermen) was the section with all the Doctor’s costumes. It made me ashamed that I didn’t dress up. The gift shop was good, but everything was expensive. I bought a box of jelly babies with lunch! Brilliant. The journey back was…eventful to say the least. It all came along fine for the first hour or so, then the train stopped at Bristol station. And stayed there. Eventually we learned that due to signal problems, the train had to stop. OK, just wait. Then, another announcement came saying that taxis and coaches would be provided, as the trains all stopped. OK, so we went to the help desk to try and find a coach. Lots of standing about later, and then we went outside, where many taxis were waiting. OK, all sorted. Then another announcement came: all trains now resumed normal services. So off we went onto the train, which was packed, and everything was fine and dandy. So, aside from that complication, the Cardiff trip was a success. I recommend you go to the Doctor Who Experience if you are a fan of the show. 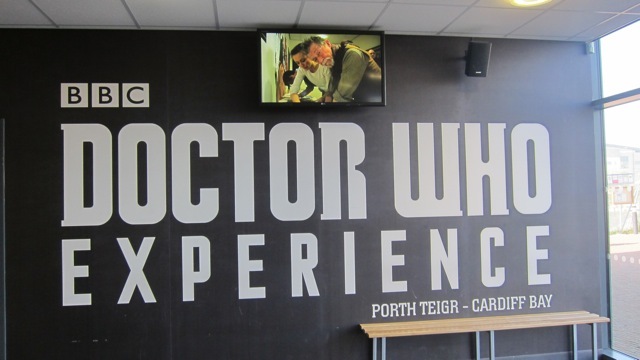 Visiting Cardiff to Doctor Who Experience with my friend Joe. I saw the photographs and it looked to be great fun. If you had visited this part of Wales as often as I have, you would realise that the main reason that there are no signs is that most inhabitants of Cardiff can’t read (or tell the time) and really don’t know what indoor toilets are for. Now North Wales (where I originally came from) is a different matter…..
Oh, my young friend, I am SOOOOO jealous. But it felt like I was there with you from the description. Wandering around Cardiff – would you have found those filming locations if there had been signs to direct you to your destination? No! So lucky you again. That is all part of the adventure, the getting there, the there, and the getting back. So the first eight doctors were highlighted on one floor…to represent the first series? And the rest of the doctors elsewhere as part of the reboot? Was the Face of Boe as huge as it looks on the telly? Can’t wait to have my own experience! Thanks for sharing this. Love it.